Frozen Inferno is based on the two basic elements in nature, fire and ice. The game theme revolves around these elements and has a mystic tone added by the many magic symbols like wizards, scrolls, capes and so on. The name of the game comes from the two modes that are available, frozen and Inferno correspondingly. Both modes have the same setup of symbols, but the colors are drastically changed in each mode. The frozen mode features snowy mountains with dominant white and blue colors, while the Inferno mode has volcanoes erupting with fire and a dominant red color across the screen. The symbols of the game are made with a very high level of details and great animations, making Frozen Inferno a visually attractive video slot game. There is also a mystic and dark background music to be heard as you spin the reels, making the overall game play intense and exciting. Frozen Inferno is the latest release we got a chance to see coming from the great software provider Williams Interactive. This name has been around for a long time in the online gambling business and they have a very big offer of video slot games. Their games can be found in almost all mayor online and land based casinos as well. 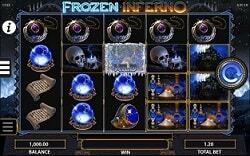 With Frozen Inferno the designers went through a lot of work but managed to create a really unique and interesting video slot game, with great visual effects and even better bonus features. We are sure the following releases by Williams Interactive will be on an even much higher level than before. The first thing you will notice about Frozen Inferno is the big number of pay lines set at 40, whose number can’t be changed. There are also 5 reels and 4 rows installed, making way for a big number of winning combinations to happen. The bet levels can vary starting from the minimum $0.40 and up to the maximum of $200 per spin. If you get caught in a long winning streak you can always use the Auto Play option and enjoy your wins on the screen like a boss. The best part about Frozen Inferno is the bonus features but also the entire game play design. You will notice that before you start playing there are two modes available and you have to choose between the Frozen mode and the Inferno mode. The difference between these two modes is in the symbols appearance and the functions of the wild symbol. The frozen mode has an ice wild symbol, which is basically a sticky wild and the inferno mode has a fire symbol which moves around random positions on the reels. Once you start spinning one wild symbol will be added on the screen and a maximum of 4 wilds can be on the reels at the same time. The free spins bonus is triggered with the maximum 4 wilds on the screen and a bonus symbol on the reels. Unlike a standard bonus here you have an unlimited number of spins, but it lasts only until you get 5 wins on the reels. The catch is that with each win one reel from the left side is switched to the opposite chosen game mode, so you can also win the wild symbol from that mode as well. Since a maximum of 4 wilds can be on the reels at the same time, during the free spins you can get up to 8 wilds in total, 4 from the Ice wild and 4 from the Fire wild. 8 wilds on the reels is a guaranteed big win in any video slot game. There is also another smaller bonus feature to be won in the form of a pick bonus, but the prizes offered are generally small in size. 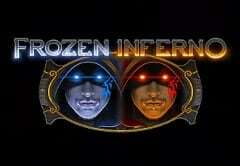 Frozen Inferno is a high variance video slot game with an interesting bonus round and a big payout potential. We are certain that wins over 1,000 x total bet can be easily achieved during the free spins. Frozen Inferno is one of the better games coming from WMS and we are sure that many players will enjoy spinning the reels. The overall design, the visual effects and the big payout potential in the bonus feature are reason enough to give it a try for real play. We are sure you won’t be disappointed at all.